Summer is officially in full swing, and the Fourth of July is just days away. After a day of celebrating in the sun, be sure to grab your camera for the evening’s main event: fireworks. Whether you’ve photographed fireworks before or are just starting out, this year, we want to challenge you to expand your creativity by taking your Fourth of July images to the next level. 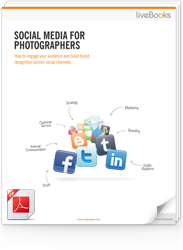 Charge your cameras and dig out your tripods! Get prepared and inspired, using this behind-the-scenes look at how these images from photographer Greg Pease came to life. 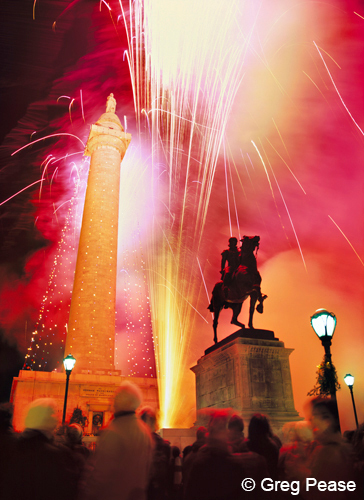 Guest blogger, Greg Pease, is a photographer, located in Baltimore, MD. Specializing in location photography, he uses his expertise to capture images of people in the workplace, aerials, and landscapes. Find him online at www.gregpeasephoto.com. Fireworks displays have always sparked my imagination with their light, colors and patterns. Early in my career as a professional photographer, I began documenting my hometown of Baltimore’s revitalization in the mid 1970’s. 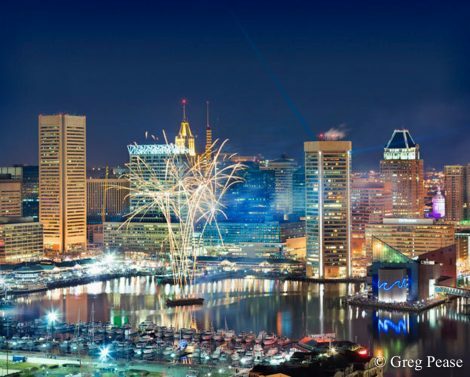 I photographed the developing skyline, using the fireworks displays to illuminate the city and its marinas that ring around the Inner Harbor and the hundreds of boats gathered to view the fireworks above. 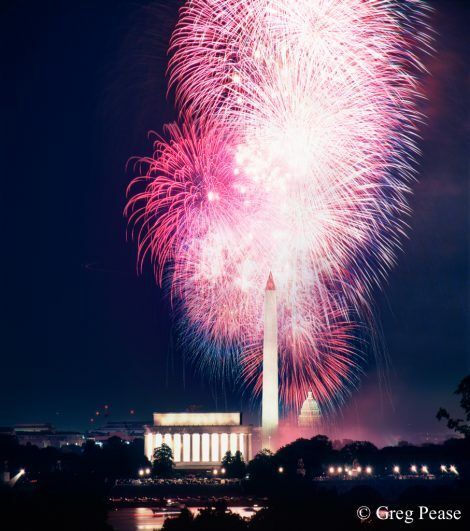 Fireworks provide a creative opportunity to use the quality and massive volume of light to illuminate and provide color and drama to large-scale subjects and scenes, such as landmarks, monuments and skylines at night. 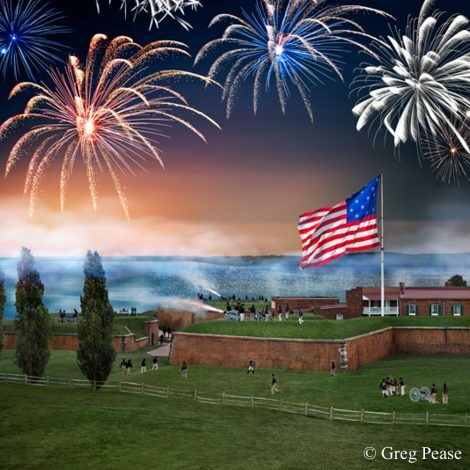 In 2011, I was hired by Visit Baltimore to photograph the reenactment of the Bombardment of Fort McHenry for their kick-off ad campaign for the Star-Spangled 200 Bicentennial Celebrations commemorating the War of 1812. Photo Notes: This photo was produced using seven re-enactors and one cannon moved to multiple locations while shooting from a scissor lift fully extended 50 ft. high. The image was created in Photoshop by assembling the multiple components including the flag, cannon fire and fireworks into a single image. 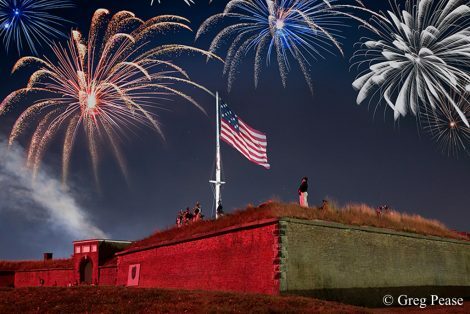 Photo Notes: Two cameras were used to shoot this photograph, one for the fireworks and the other for the Fort to create a single image. My planning begins with an aerial photo of the general area of the fireworks display. Google Earth Satellite is a pretty good source to determine where to set up cameras. Pro-tip: Reflections in water are an enhancing feature, so look for water view locations. I set up two cameras, each with its own tripod. 45mm and 90mm are my favorite lenses (with a full frame sensor camera), and both are tilt/shift lenses, which enables me to shift up and down or vary my image format from horizontal to vertical to include more fireworks in the sky or water reflections below. Long exposure noise reduction should be enabled. f5.6 @ 5 seconds @ ISO100 was successful in many of the examples shown here. Set your color balance. My preference is for a cool colored sky to make the generally warm fireworks visually move forward. Shoot as the fireworks are ascending and descending, and vary the effect by shooting only the descending fireworks. This technique will prevent the fireworks from obscuring the buildings, etc. Shoot as rapidly as you can before the smoke builds up. There you have it! Try out these tips this weekend, and be sure to share the results with us by tagging #bestofLB8 on social media.